News, Products & Solutions | We're passionate about Electronic Test & Measurement Accessories. Our team, located in Arcadia, California, is thrilled to announce that our plant renovation has finally been completed. We look forward to continuously evolving our company to work efficiently to sustain and improve our services to our loyal customers. Orders generally ship within 1-2 business days and we are committed to providing our customers with the best service possible. Determined to serve the specific needs of all of our customers we offer custom solution capabilities. If you require a part not currently listed on our website, please reach out to us so our dedicated team can work with you to designing and manufacturing the specific part for you! It’s been over two years since we received our ISO 9001:2015 certification. Since that time E-Z-Hook has been through three successful audits. We are proud of our ongoing improvements that are constantly being implemented across departments. We consistently review internal and external feedback to improve our procedures and ensure our customers get not only the best service, but the best quality product. E-Z-Hook is proud of the effort our team places on adhering and living by the spirit of the ISO 9001:2015 standard. We like to think our products are certifiably well made – why don’t you give them a try and tell us! These needle clusters are used not only in E-Z-Hook products, but sold as raw material components to many of our clients. We even sell them to “competitors” for use in their products! While we are known for finished goods, many of our raw material components are available for sale. Over 20 years ago we started making these needle clusters for our p/n 82-2. Since then we have developed variations with 23 to 33 needles. These are hand assembled in our plant in California by the thou sands. Contact us to meet your design requirements with our needle cluster technology. This product technology is popular with our Aerospace and Defense clientele. Both the X100W mini-hook and XM micro-hook style are available in high temperature versions. When environments or sterilization processes require products to withstand high temperatures we have existing options in our “standard” product offering. In both our X100W and XM product line we offer a modified “x” version (p/n X100WX and XMX) that is molded with mineral reinforced nylon. These modified versions have been tested to support high temperatures for extended periods at 122C (250F) and short cycles as high as 150C (300F). If higher temperatures are required then our X100WXH (available in black, white and gray) is tested to 175C (350F) for short period and 150C (300F) for extended periods. 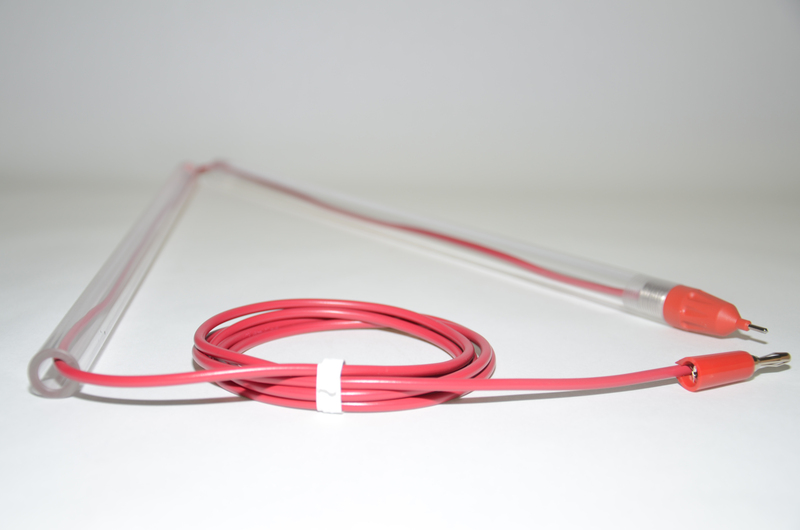 All of these parts can be made into high temperature test leads by using our 300 series (24 AWG Teflon Wire). Let us know your requirements and we will always do our best to offer a product solution. For the past 47 years our E-Z-Hook President has been the first person in the office. His passion for his business and his unwavering focus and hard work drive him daily. Recently his passion has found a new focus, or should we say additional focus. Don’t get me wrong, he still is the first one in the parking lot most mornings, but a few early mornings a week you will find him elsewhere. Don’t misunderstand – he is still focused and hard-working, but even the most driven businessmen need a recreational outlet. So where is he? Is he golfing? Is he sleeping in? Having a leisure LATE breakfast reading the paper? Not Phelps. 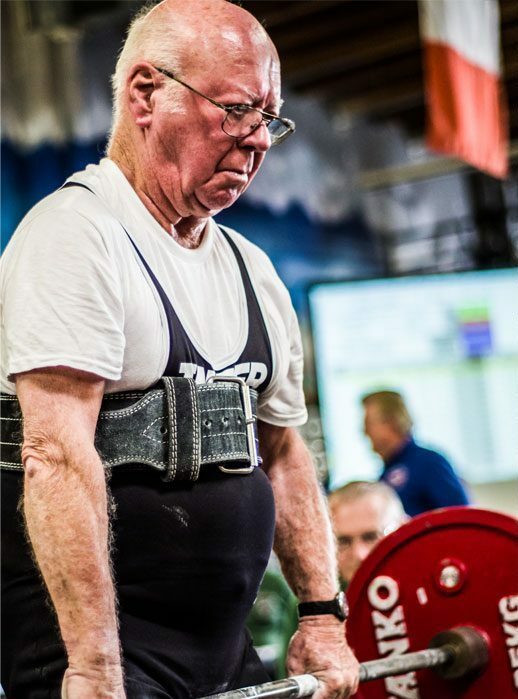 He is at the gym training, training hard and very focused for his next Powerlifting competition. And yes, his gym workout slot is the FIRST one available in the morning. Wow – some things never change. This blog might seems a bit unrelated to Electronic Test Accessories… well, perhaps that is true. But I think it’s relevant because it shows the E-Z-Hook spirit, energy and can do attitude as exemplified by the company President. As a company we pride ourselves in being different, trying something new to make a product work, believing in ourselves. That comes from somewhere. This is part of the company culture. Recently a young inventor and aspiring engineer shared their ALARM HAT created for a school invention project. She thanked us for the miniature alligator test leads that helped her project be a success at her class inventors fair. E-Z-Hook markets our products to all kinds of industries and it is always fun to hear about uses that we never expect. 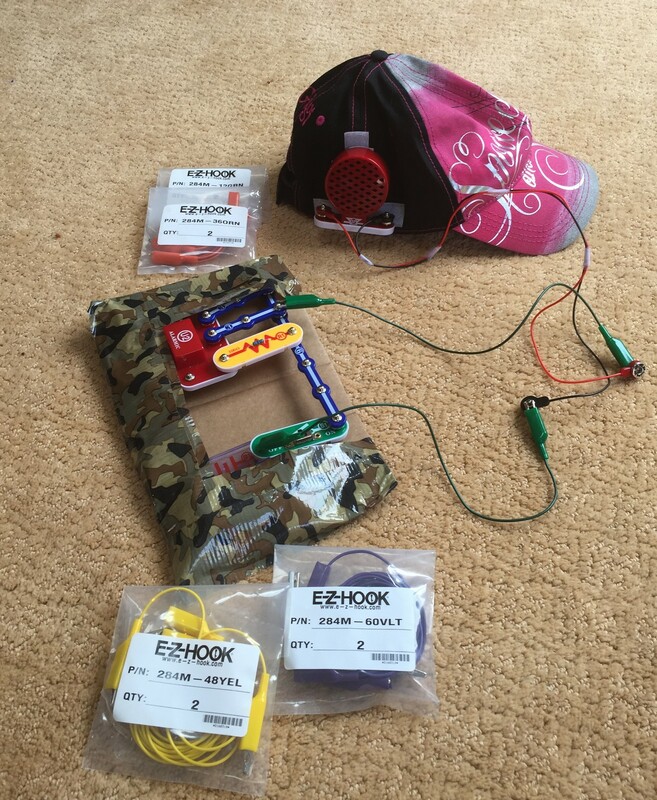 With the help of our 284M miniature alligator test leads this young inventor was able to connect to a snap circuit panel they had created and control the noise to the ALARM HAT from a few feet away. They even promoted the various colored leads and lengths as design options and customization alternatives for this cool device. Better yet, they got an A on the project! Way to go! Did you know this alarm hat is apparently perfect for annoying siblings? It’s so easy, just put the hat on them and turn it on to ring or buzz. Thanks for sharing! Keep inventing! In the world of shrouded banana plugs and sockets, E-Z-Hook has a simple solution when your old meter doesn’t accept the newer shrouded banana plug leads that most companies manufacture as “standard” today. You don’t need to update your perfectly good meter, just invest in our part number 9371 which offers a standard banana plug with shrouded socket. Use its standard plug to gain access to your meter and then plug your shrouded test lead into the rear of the plug. Now you can use both standard and shrouded plugs. Recently a Power Company approached us with certain requirements for two different test lead options. Their field technicians had various Fluke meters, some accepting shrouded plug and some that did not. They were not in a position to standardize meters, but wanted a specialized banana plug test lead that could work with a shrouded meter, yet allowed for another plug (shrouded or non-shrouded) to be plugged in or stacked in the back. The test lead needed to have this stacking shrouded banana plug connector to an alligator clip. In addition they needed color coding on the leads for easy identification. With the E-Z-Hook kilo color options we were able to provide leads in one solid color (connector and wire) as well as leads that had connectors in one color and the wire in another color. Ultimately we made test leads in 6 different color combinations, all 16 feet long, and all with a shrouded banana plug connector to alligator clip. Customer satisfied! So what was the solution for the field technicians with old meters that wouldn’t accept a shrouded plug test lead? Easy. We were able to provide a similar customized test lead option by combining our 9371 standard plug which has a stacking shrouded socket, to a 9306 shrouded banana plug. This option then gave those technicians with an older style meter to use any of the company designed shrouded test leads. The shrouded banana plug could stack in the back of our 9371 or into the 9306 on the other side. These lead options created a better level of uniformity and the Power Company was not required to replace and unify older meters for their large technician base. In 1980 E-Z-Hook entered the automotive sector with our XJL insulation macro-hook connected to a lead with a standard alligator connector on the other side. This product 619XJL was offered in a black and red set of 18″, 36″ , and 60″ standard lead lengths. Today, 36 years later, this product can still be found in most automotive jobber trucks (think Matco, Snap-On, MacTool, etc). We have sold thousands of this product, which single handedly helped us enter the automotive after market for repair and testing. Today the 619XJL remains a staple, and one of our most popular automotive leads. Variations of this test lead set include a straight banana plug connector or a shrouded right angle connector. All of these products work with most standard Digital Multi-Meters. For environments that require a higher heat resistance and more durability than our standard PVC wire provides, we do offer all test leads with silicone wire if requested. In the early 90’s we introduced our XEL piercing hook into the automotive market. This narrower hook has an angled front to navigate through wire bundles, as well as a v-shaped design for grabbing and centering the wire or cable prior to piercing. It was introduced as an alternative lead set combination to the XJL options. In addition we designed it to be available without a factory installed lead. This XEL version offers a shrouded banana socket on either handle side, allowing easy flexibility to use with any standard banana plug lead. Much like our XJL versions, the XEL has become a popular staple in most auto repair and test mechanics tool boxes. So, what next? As we spoke to distributors and automotive jobbers we realized that the automotive repair and test aftermarket really lacked in the “accessory” area. For most equipment companies the test leads and components were an after thought – and often not well designed or manufactured products. Automotive technicians would purchase fabulous multi-meters but the test cables supplied with these were often junk, couldn’t carry a proper signal, and needed replacement within a year. At E-Z-Hook these test leads, test cables, and connectors are our specialty. That is what we focus our manufacturing quality on so we could easily compete with great replacement products and test kits. That is exactly what we have continued to do in these past 10+ years. Today in addition to our standard XJL and XEL test lead sets we offer various banana plug lead sets and individual leads specifically designed for automotive use. One of my personal favorites is our 9183-144BLK banana plug jumper test lead. Why do I like it – because while learning about our products for this industry I asked why in the world would we make something so long? 144 inches? 12 Feet? I was reminded that this length (the approximate length of a car) would allow a technician to be on one side and connect to something on the other. Made sense to me, and obviously to a lot of automotive test and repair technicians. Due to it’s popularity in the field we now bundle this test jumper in with many of our automotive kits. It can be purchased individually or is part of our popular 3519 and 3520 test lead sets. 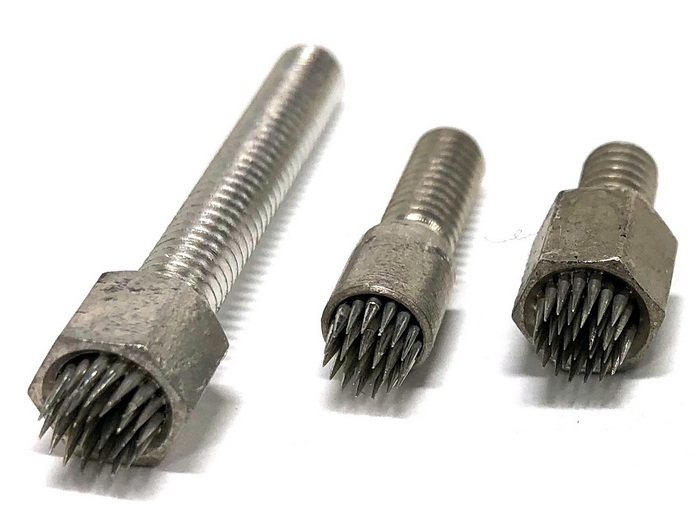 In addition to leads we offer various kits including our insulation piercing hooks as well as alligator clips, back probe needles and other connectors. All kits include various lead options and are offered with either our XJL or XEL piercing macro-hooks or the 8064 needle back probes which we just introduces to the market in late 2015. Testing was never so easy. Over 35 years of PROVEN EXPERIENCE IN THE FIELD. E-Z-Hook is often best known for manufacturing “little things” for test and electronic applications. These products are often used in a lab environment or designed to be connected or integrated as part of another manufactures test device or system. What many companies don’t know is that E-Z-Hook designs and manufacturers many products and kits for companies field employees and test engineers. E-Z-Hook services a lot of industrial companies. We have created solutions for field employees that have taken us in different product directions then our “standard” lines. Our long-handled probe line is an industrial test solution used by field technicians predominately servicing AC POWER, UPS or COOLING SYSTEMS. Often these systems being tested are behind gated infrastructure, or it’s simply not safe for the technicians to be to close, let alone touch something directly. The long-handled probe has a hard straight tube which extends to 30″ for extra reach. This length (or distance) is important when testing, but a little long to carry around in your standard toolkit. Not a problem. The long probe was designed in two pieces, which can be easily and quickly screwed together on site. If purchased as a set they even come with a simple soft zipper nylon carry bag for immediate storage. 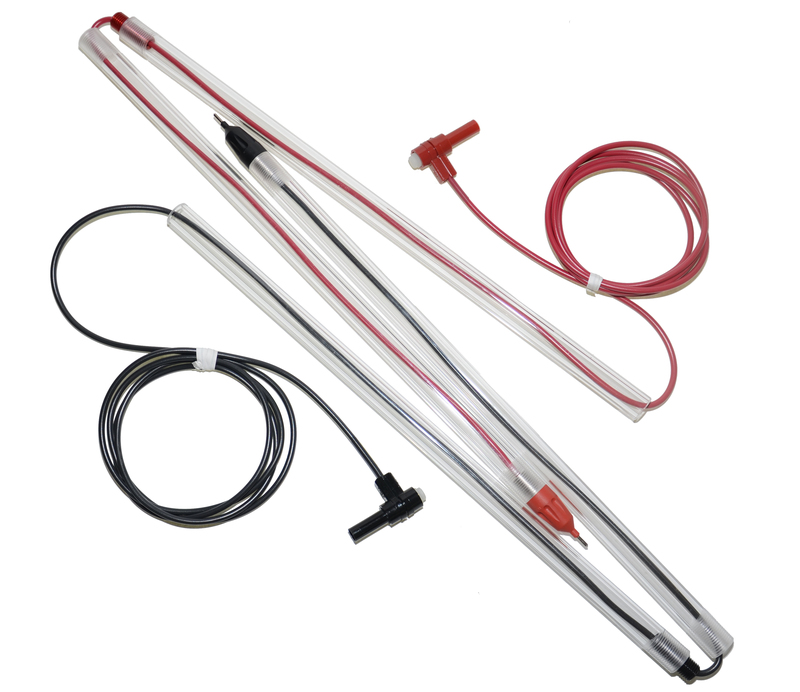 Long-handled probes are available with three standard wire length leads 36″, 48″, or 60″(measured from back of hard tubing to connector). While our most popular connectors are shrouded and standard banana plugs, these probe test leads can be customized with virtually any connector type. Interchangeable probe tips are also available pending the application need. So next time you wonder how someone can test something behind a cage, or that says “warning- do not touch”- now you know. Just a reminder, these are for commercial use by trained field technicians. The 8064 back probe is now available in red, black and yellow. These nifty little needle probes are the perfect electronic accessory when a quick test connection needs to be made. The one side has a banana socket and accepts most standard banana plugs. This part can easily be connect to most standard banana plug test leads. Versatile for multiple industry applications we find these particularly popular in the automotive testing and repair fields. Pick up a set to add to your toolkit today! Photo shows the 8064R/B set.